Last night I was fortunate to be invited around to game in my local vicinity. 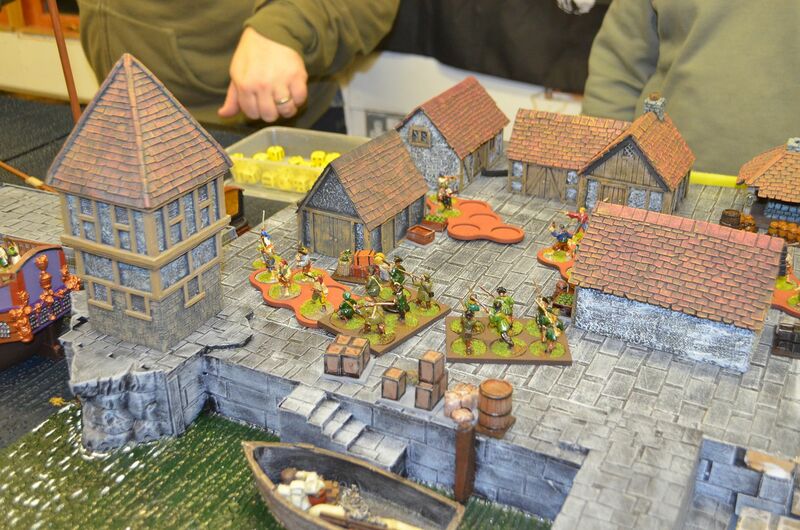 The game was hosted by Jim Bibbly a prolific modeller and painter who graces the pages on the KLead Adventure Forum. Also in attendandance were Mamalute & Dr De'ath of the same forum. 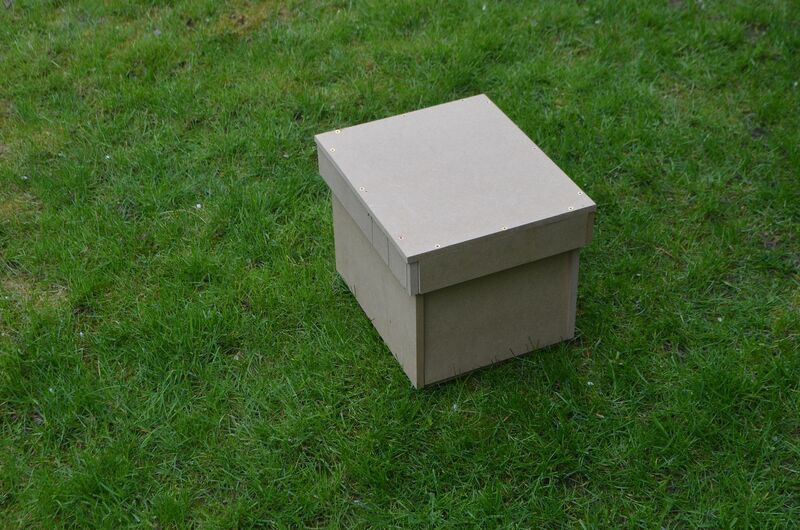 Another parcel arrived today from ebay. A Kiddies plastic castle manufactured by Superplay. 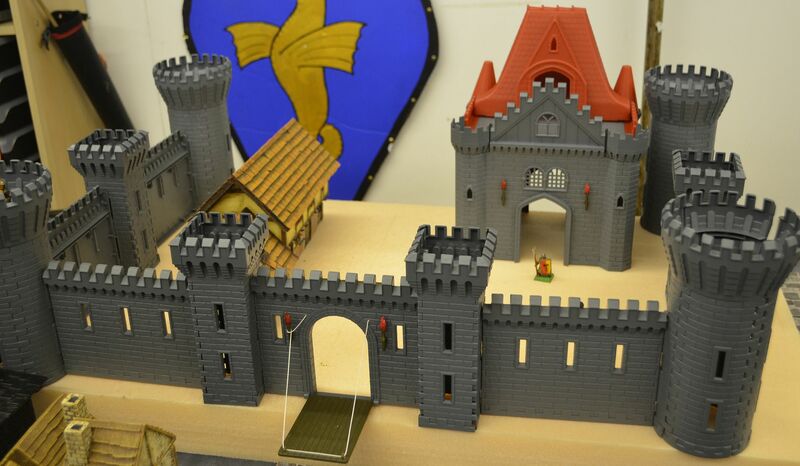 For the princely sum of £15 inc postage I receved a barely used castle set. Of particular interest are the four round towers and the Castle Mansion. 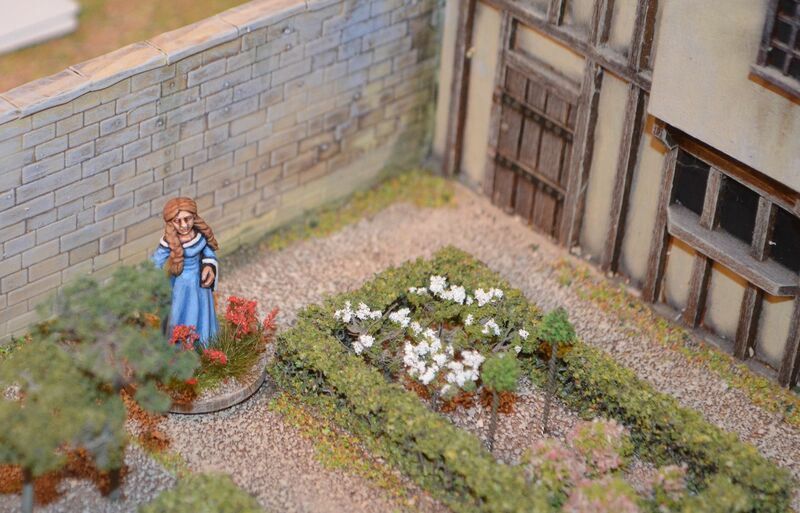 From a scale perspective it works with 28mm and provides a whole host of options. 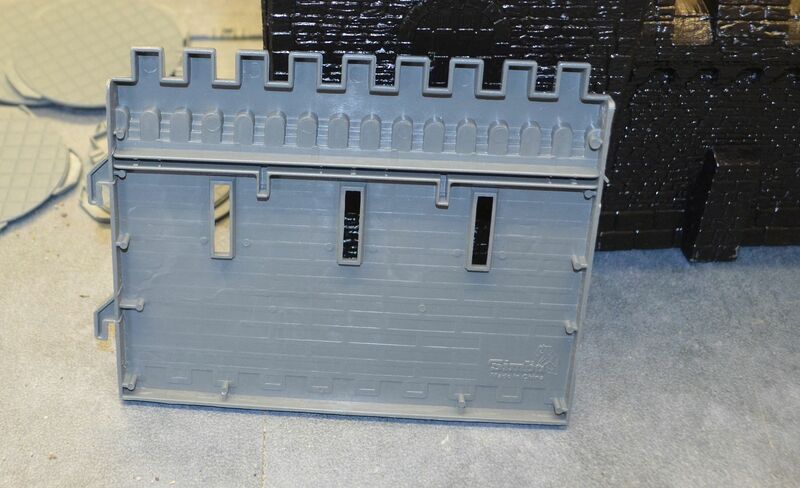 The only negative with this purchase are the reverse side of the castle walls. 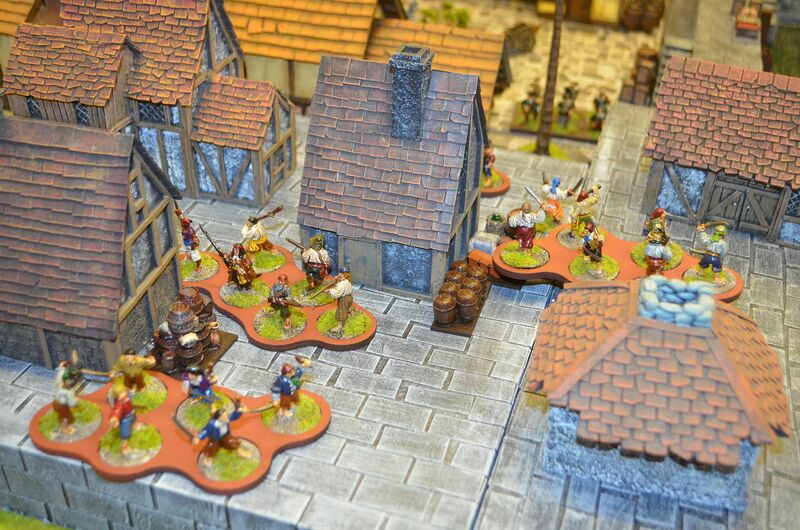 These are ‘not filled’ and the walkways are just simple plastic wooden effect boards. One option might be to take these walls (fill in the reverse side with filler and mount them back to back on foam blocks. I reckon the set has enough walls to create a four foot run done in this way. 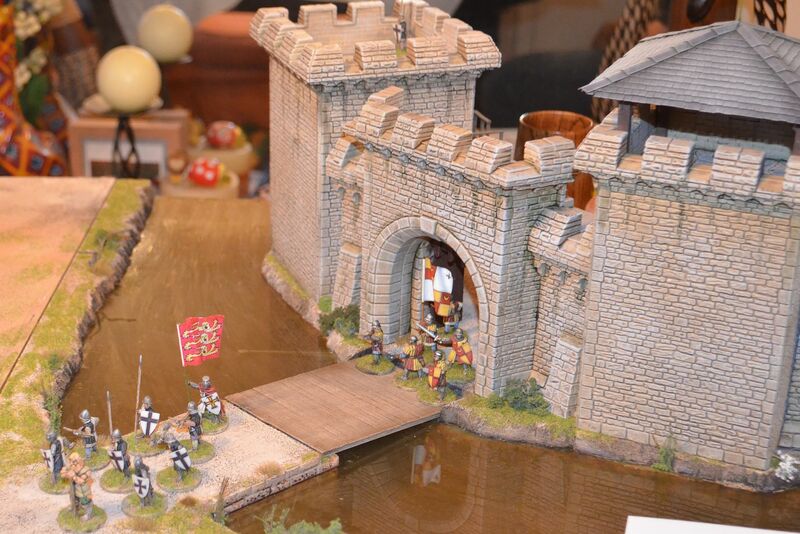 At the moment I am debating whether the round towers would work better as a suitable barbican gate house for the keep. 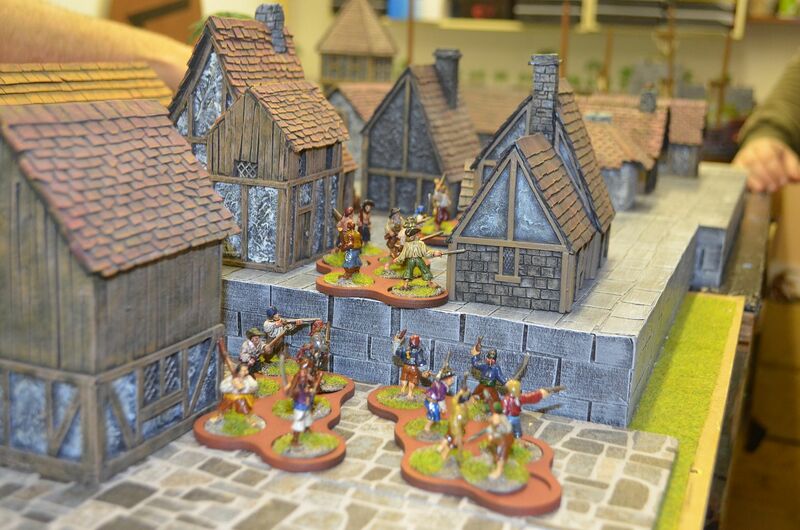 Alternatively I might build a better gate for the town - so again the round towers could be used here. 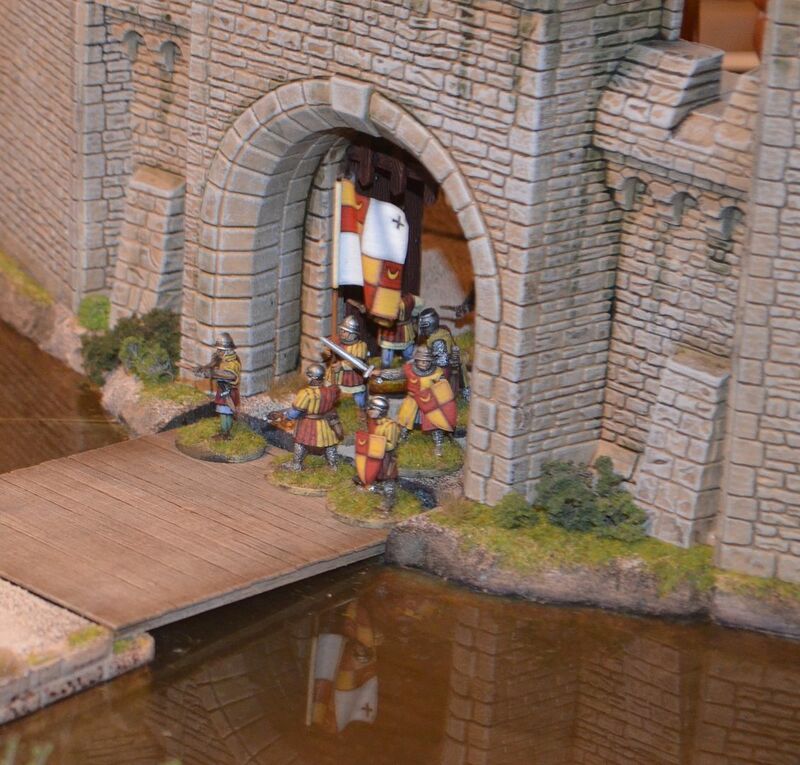 The Games work shop gate is set in a wall section but I reckon this could be cut out and used in the conversion. 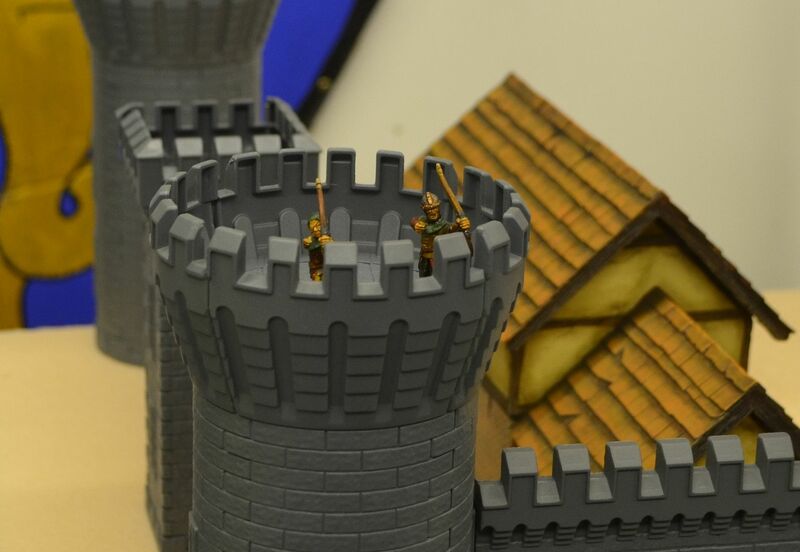 Alternatively These might form the framework of the castle keep with some big modifications done to the walls. First up the first of my figures arrived this morning. 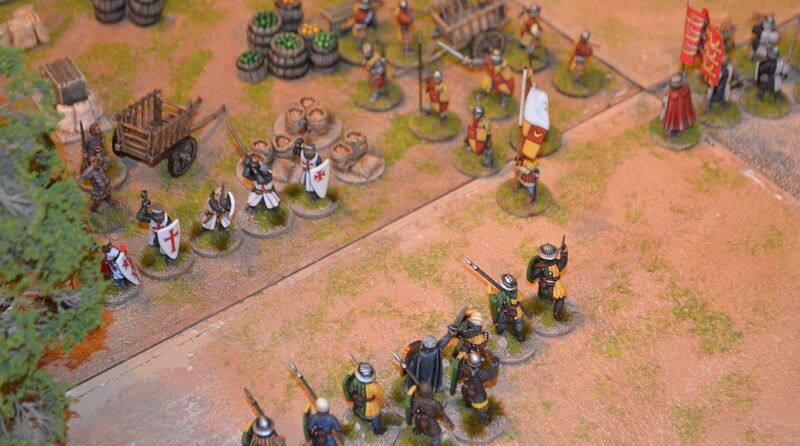 A box of the Fireforge mounted sergeants and a box of men at arms. 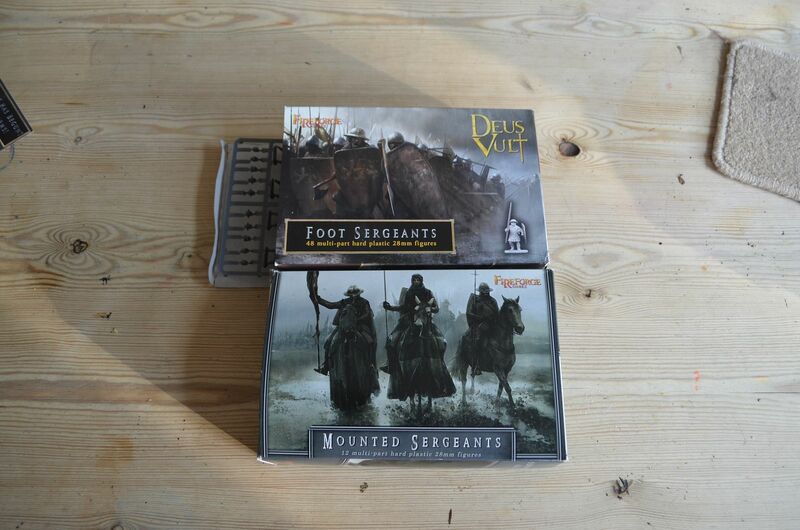 These will form the core of my Sheriff of Nottinghams garrison. This will be first time I have worked with plastic figures in a number of years so fingers crossed that they will come out alright. 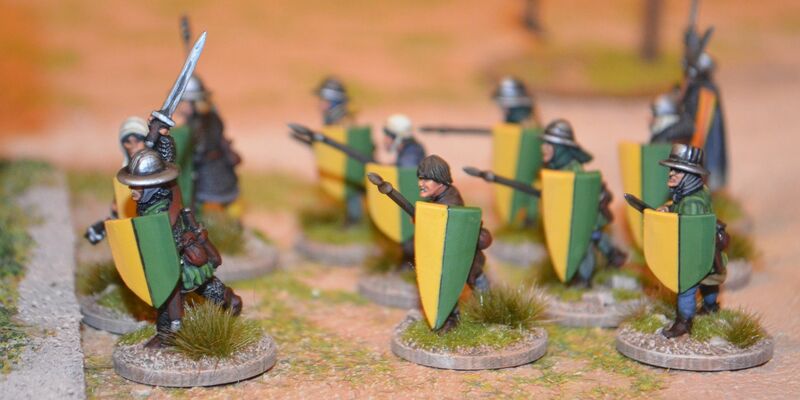 The foot soldiers (i believe there are 48 of them) will be split 2/3rds spears and 1/3 crossbows. Next up is a small town statue that I think fits the part really well. 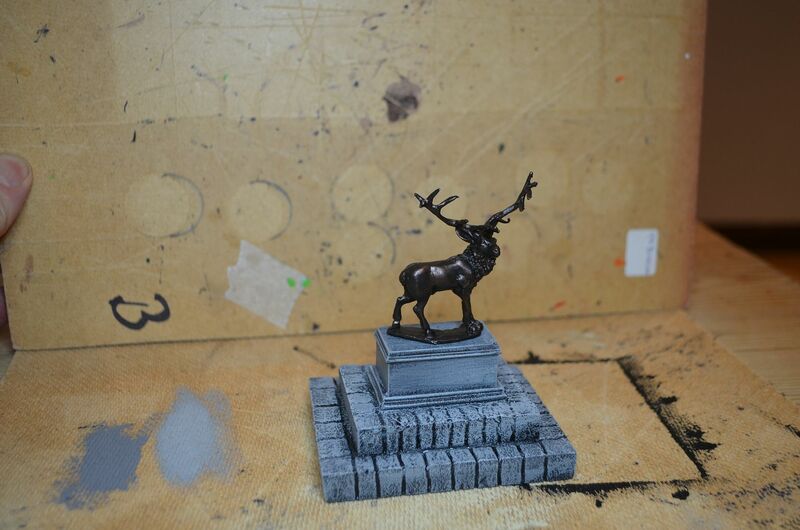 I have used one of the tombs from the Ainsty Castings cemetery as a pedestal and the Stag came from Foundry. Given that these animals were property of the crown in the time of Robin Hood I think it works quite well. Finally, I finished stripping down the fortified priory I built many tears ago. This was constructed out of hardboard and cork. Its now been given a new base coat of acrylic black (it was previously painted in enamel grey ! 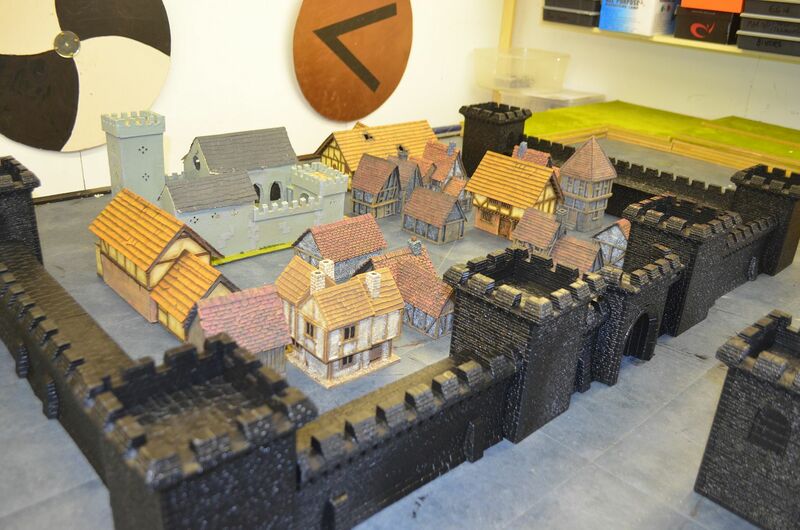 ), the ground has been retreated with sand and grit, and I have put new wooden decks ion the tower roofs and battlements. It still need to do the roofs but haven’t decided whether these will be tiled or planked. Having blown my budget on various buildings, castles, and other paraphenalia in the past few months the rest of the figures are going to have to wait for the moment. 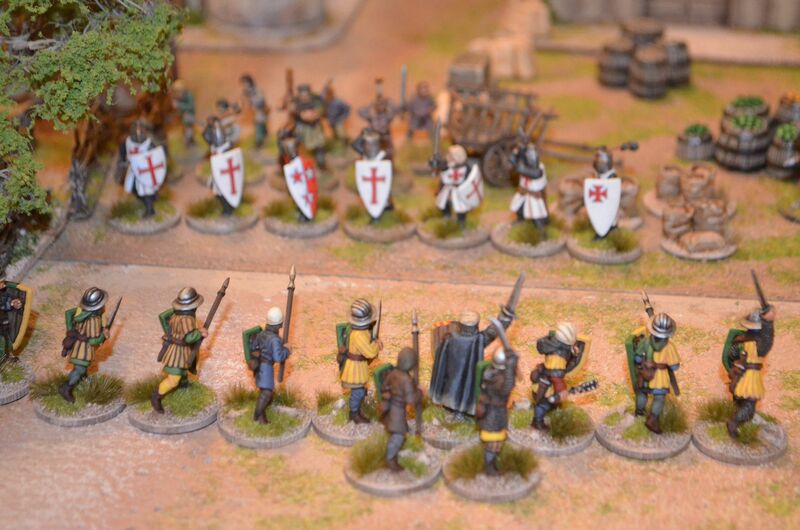 I do however have my eyes on some of the ranges from Black Tree, Crusader, Fire Forge and a couple of others. So with Pirates almost complete I have now turned my attention to a new genre. The Tales of Sherwood Forest. With ample trees and rivers already built I could turn my attention to the focal point of this game. 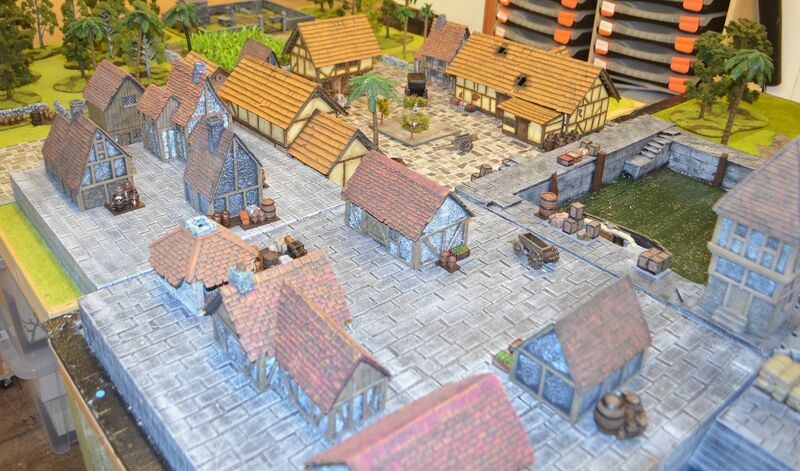 The City and Castle of Nottingham. As befits a walled medieval city I needed sufficient walls and gates. 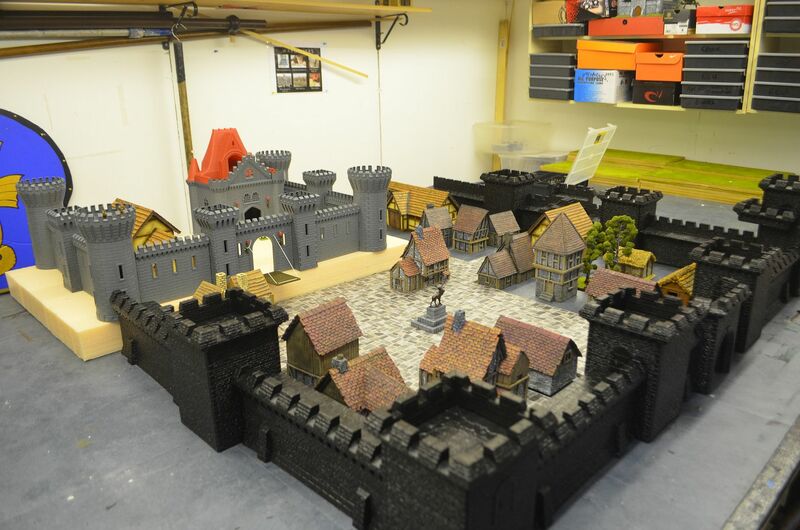 So a quick scour on various boards I settled on the Games Workshop plastic fortress as my starting point. Some bids later on ebay secured two of these beauties. 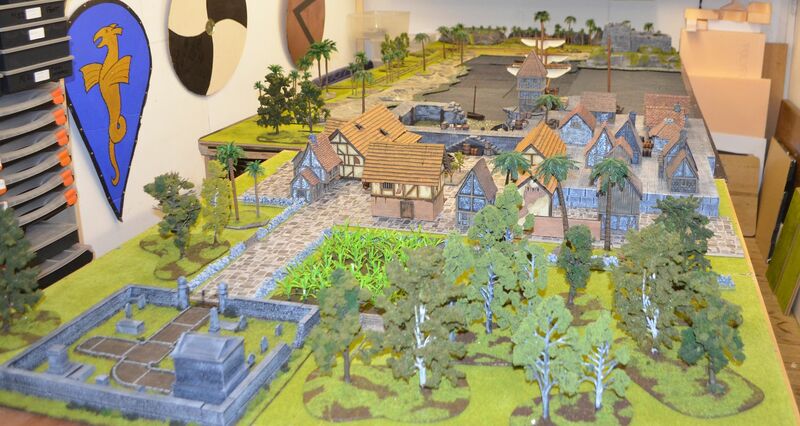 What you can see in the photo are the walls and towers all assembled with one layout for the city. At present they only have the black acrylic primer so still need to be finished off with grey drybrushing. Inside the city I needed buildings. Fortunately the Conflix buildings are perfect BUT I needed more. 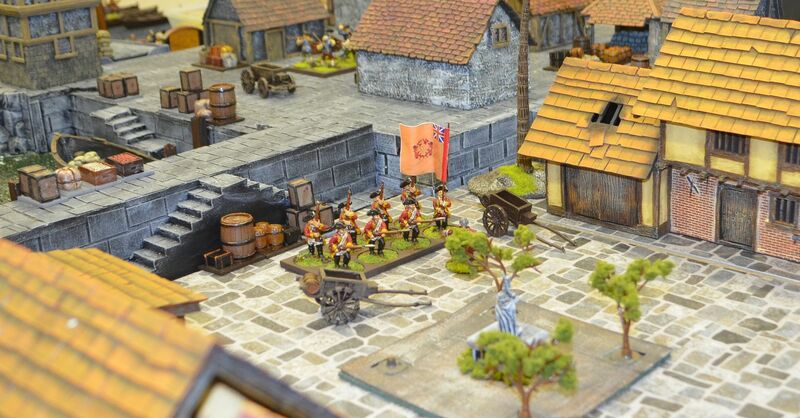 Again reviews across the website revealed that some folks were raving about the 28mm buildings from PMC. A few of these were purchased (there goes my budget for the year) and I am getting there. 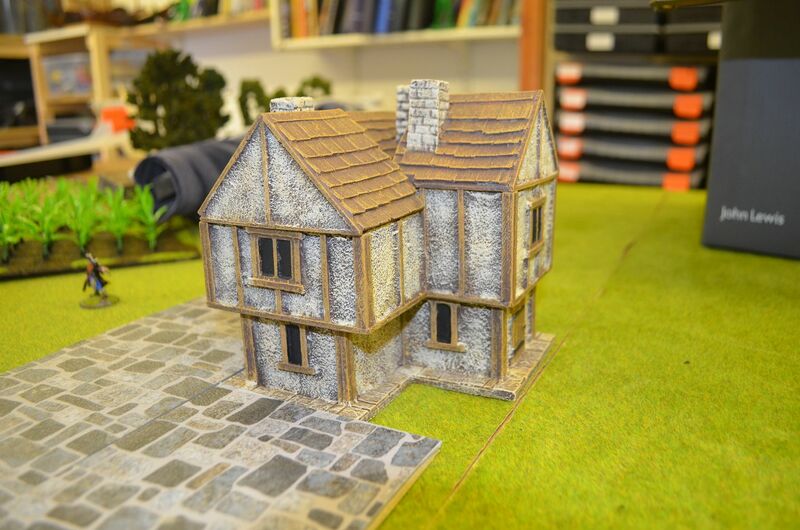 I just need to source some more Wilkinson’s vinyl tiles to fill in the towns roads and courtyards. These will be ‘dirtied up’ as they look just a little bit too clean. In addition to all these buildings I decided that my walled monastery would come out to play but it was in dire need of a repaint. 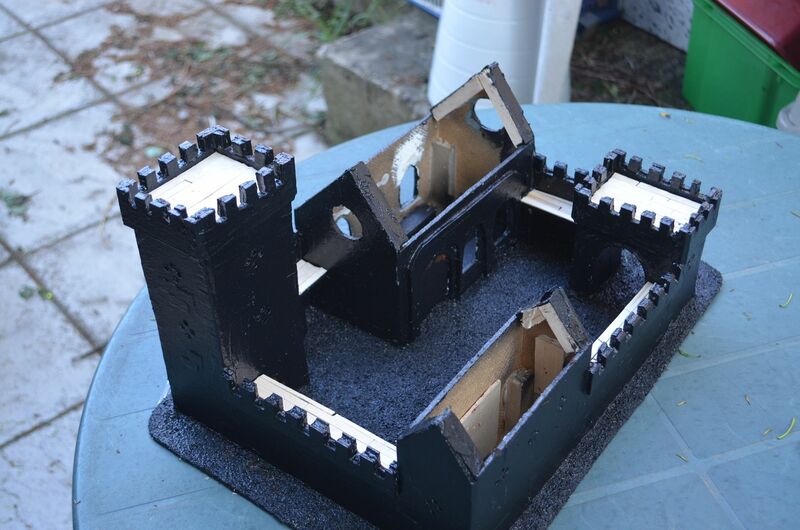 The photo here shows the monastery with its first coat of black. The Purple Rose is an ocean going merchantmen plying the trading routes of the West Indies. Now moored in the safe anchorage of St Reathams del Inglise it awaits a favourable wind for its return journey to Europe. With its hold packed with rum, sugar, spices and silver it is a worthy target of the Pirates operating in the Indies. The presence of the Ship and its cargo was known to the infamous Captain Bloodspike and it was his intention to steal the ship and its booty. The Pirates would win in this engagement if they could capture the Purple Rose and sail this off the board. 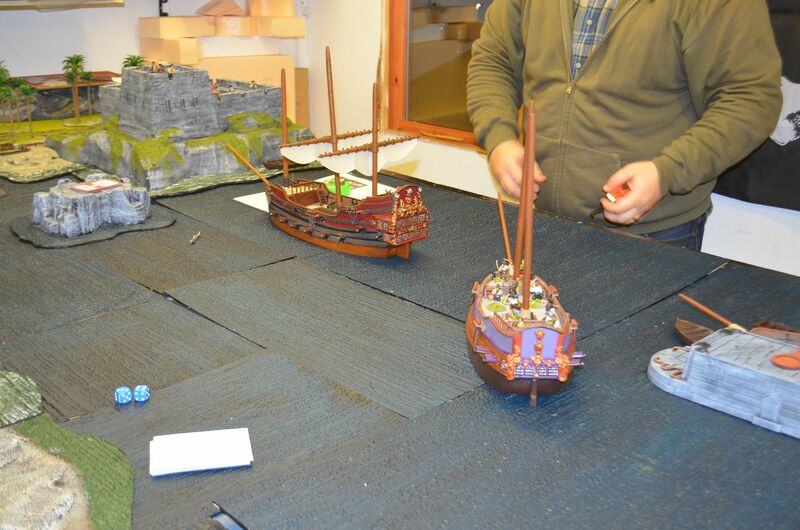 The Locals would win if they could prevent the Pirates from accomplishing their objective. The table was set up. To the East we have the approaches to the bay controlled by the harbour fort. The Bay itself is ringed with sandy beaches and in the west lies the town and port. To the west of the town lies the cemetery, sugar cane fields and woodland. In the end we only used a fraction of the table but hey it looked great ! The Pirates had 10 gangs available to them, each gang comprising of between 6-8 men. They were grouped into three crews (Red, Blue, Yellow). 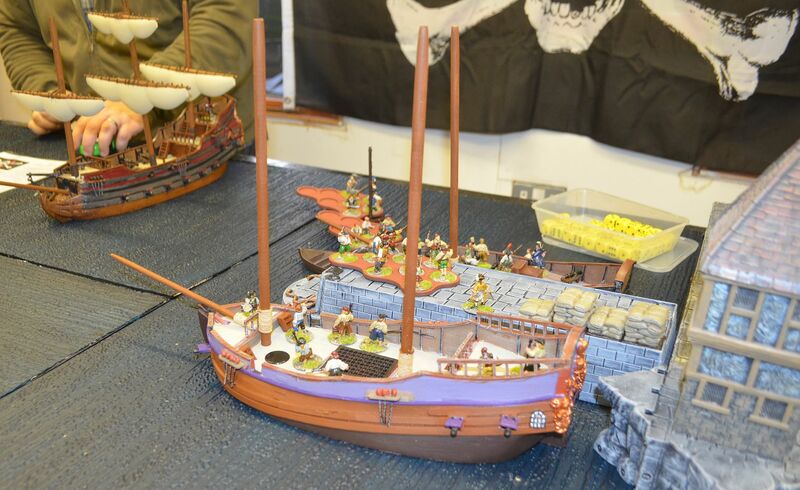 Opposing the Pirates were a mix of Garrison Regular Troops (10 men) lead by Governor Trewilly, two units of local miltia (12 men in total), a unit of armed civilians (6 men) and the crews of the Purple Rose (8) and HMS Hamster (8). 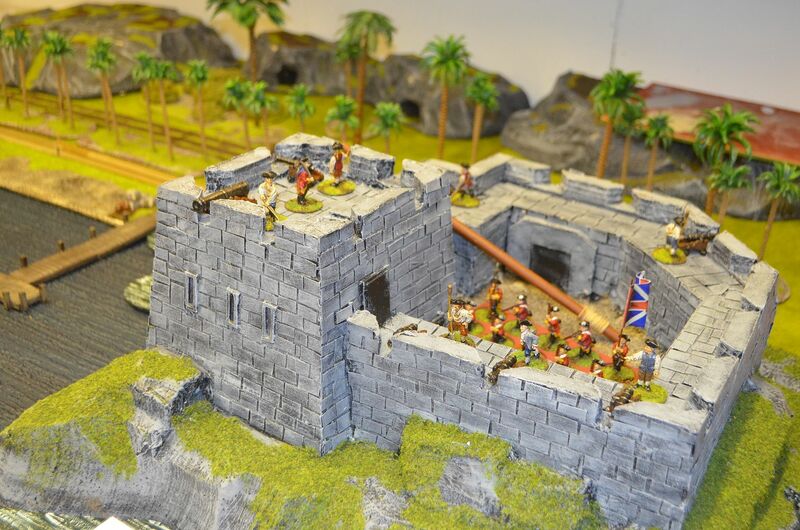 The Locals also had Garrison troops in the Fort but these were so far from the action they would never made it to the action. The Pirates definitely had both the numbers and the initiative to make this possible. 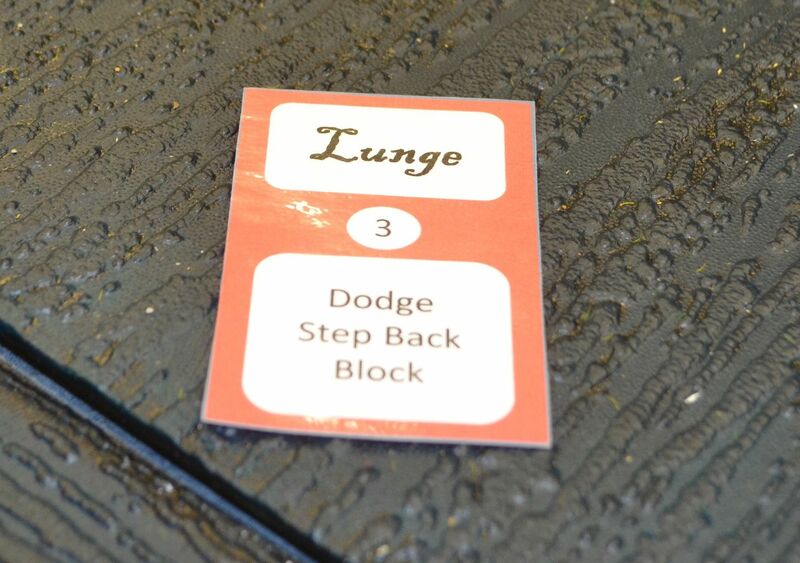 Our game started in the early dawn hours. A force of Pirates previously landed to the in the Eastern Woods silently slipped towards the sleeping town. Meanwhilst three jolly boats swept into the bay and headed directly for the quayside. I had anticipated that one or more of these may try to engage the defenders of the fort on the otherside of the bay. My players had other ideas. Heading under the cover of darkness the ships boats soon discovered that the Purple Rose was not alone in the port. Lying alongside her mooring was the Royal Naval sloop HMS Hamster. Trusting that luck was on their side the Pirates decided to wrestle control of the Naval boat first. They didn’t count on the alert nature of the sentries (a six rolled alerted the crew). Within minutes a fierce battle ensued over the thwarts and bow of the Hamster. The Naval crew outnumbered two to one were able to drive off the first boarders with a gusto worthy of the 1930’s pirate movies. With cries of alarm the crew of the Rose and town defenders raised themselves from their groggy sleep. 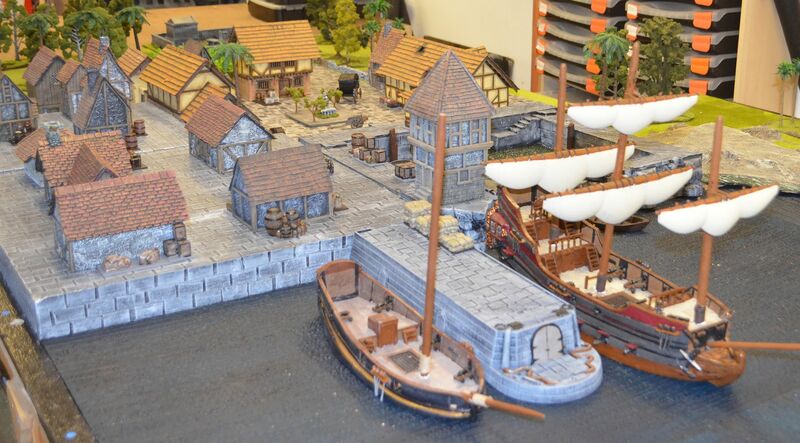 Soon after the Pirate Ship Cerberus sailed into the bay, releasing yet more boats packed with Pirates towards the docks. This added weight of numbers soon came into play with both boats now a carnage house of bodies, and injured men. It was game on. The first of our duels took place with Captain Pitt of the Hamster felling the bloodthirsty Axle Slash in a thrilling fight to the death. Probably worth mentioning how we handle the duels. In the event that a hero and villain encounter one another (distance 12 inches) they must contest a duel. With the initiative being the first to reach the other (by usual card activation). At this point the two protagonists draw the two sets of duel cards. Whilst duelling or contesting a duel the Heroes and Villains may not be targeted by other figures . 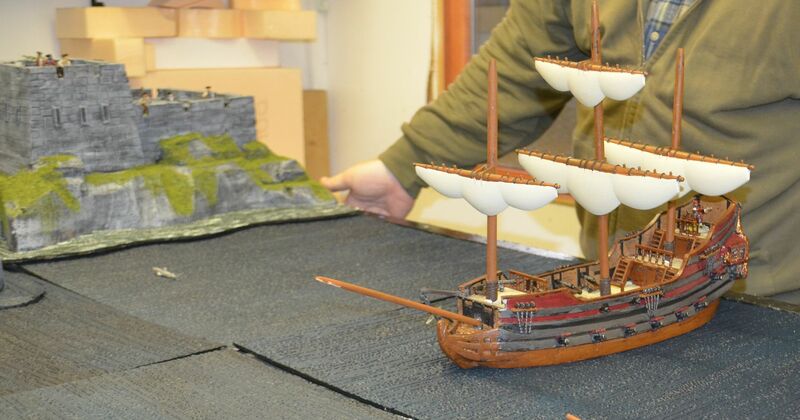 With the Pirates flagship now entering the bay the Fort opened unopposed fire with its land based cannon, a desultory set of rolls proved continuously ineffective. 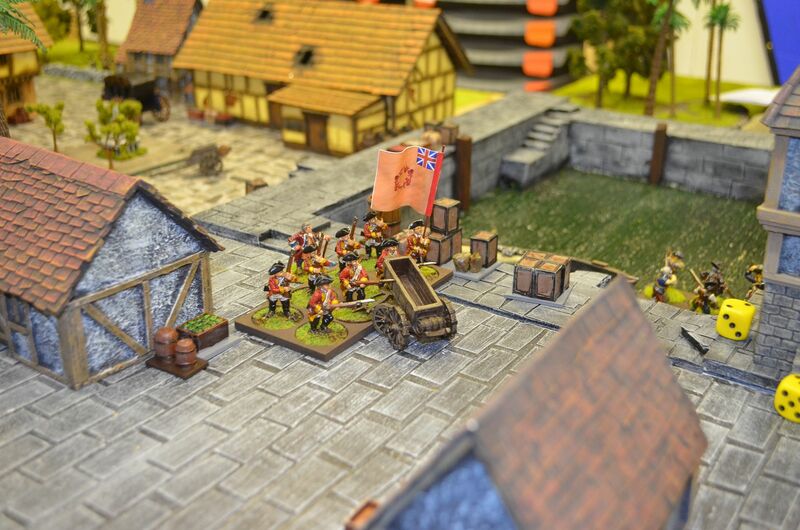 Meanwhilst the Pirates entering from the landward side had made their way into the outskirts of town avoiding the local militia. Heading for the docks they swarmed through the streets. Could the locals prevent the Pirates from capturing the Rose? Thinking that their best course of action was get to sea they prepped the ship whilst holding off the boarding Pirates. This was to no avail as the fresh reinforcements from the Cerberus swept onto the key and onto the Decks. A short bloody skirmish and the Rose was in Pirate hands, a few minutes later the Pirates had cleared the decks of HMS Hamster. Could they pull off the most audacious move possible and sieze both boats? Like the dockside the town had become a centre of fierce fighting. 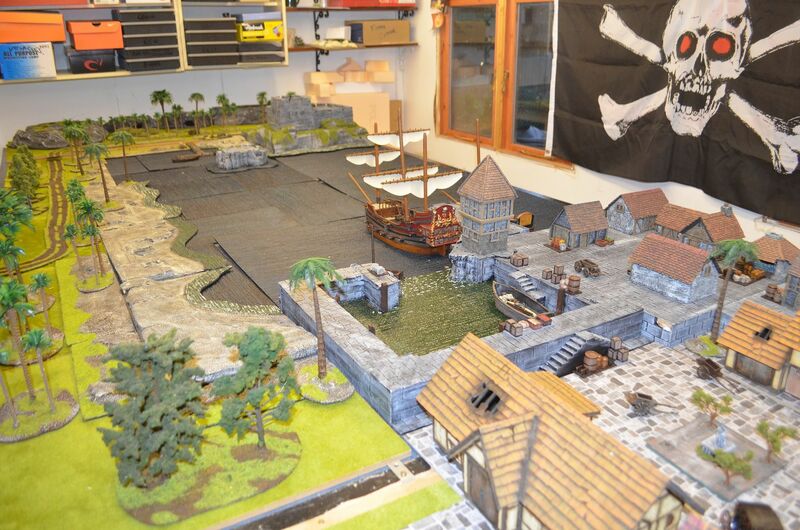 Finally the land force of Pirates engaged the local militia, with casualties building on both sides this was a fierce fight but the numerical Pirate adfvantage and sheer aggression swept the militia from the streets. All that lay in front of Pirate victory were the guns of the old fort and the redcoats of Governor Trewilly. 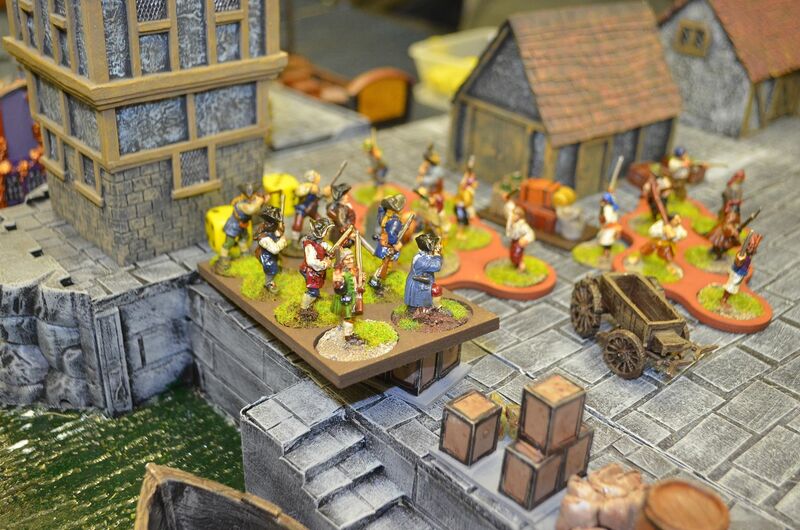 A salvo of fire from the fort brought down two masts of the Cerberus reducing it speed to near zero in the confines of the harbour and the redcoats quickly set about their business with volley fire on the quayside. With continued initiative the garrison troops retook HMS Hamster and prepared for the final battle. Governor Trewilly, bold, audacious and very stupid confronted the beautiful but deadly Rosie Gunns, three cards later he lay in a pool of blood the victim of a very quick duel. 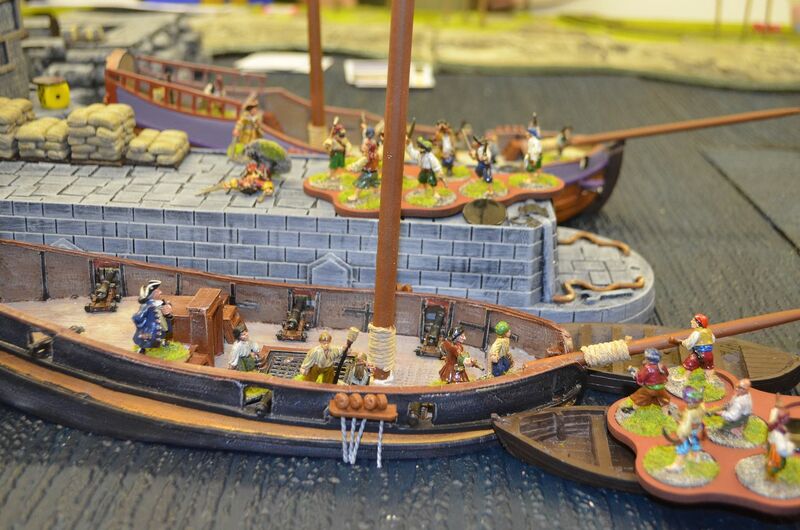 With the town now in possession of the Pirates they swept onto the dock and onto the decks of HMS Hamster. With no mercy the red jackets were butchered to a man. 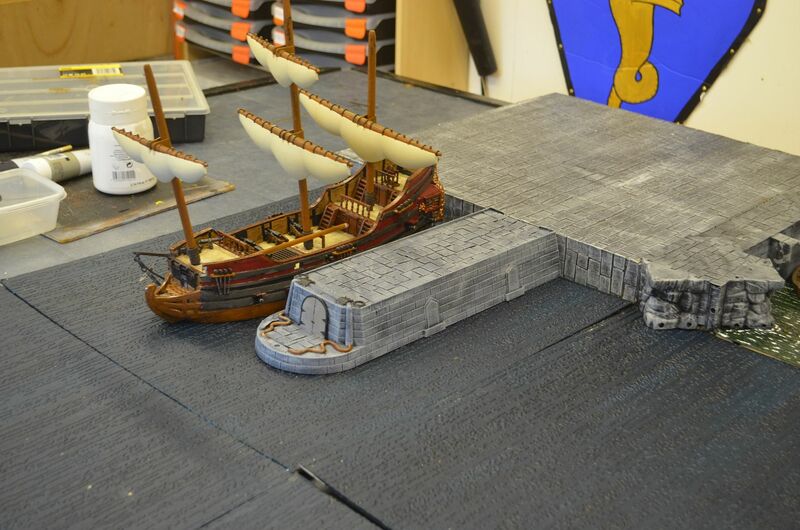 It was going to take the captured ships and the almost demisted Cerberus three rounds to leave the bay whilst under fire of the fortress guns. Could the ships escape? Well they did and the pirates sailed off into the sunset. The folks over on the Lead Adventurer forum are holding a challenge and I have decided to take part. Why this?! Well, for starters I think most countries (probably in the world) have an IKEA. 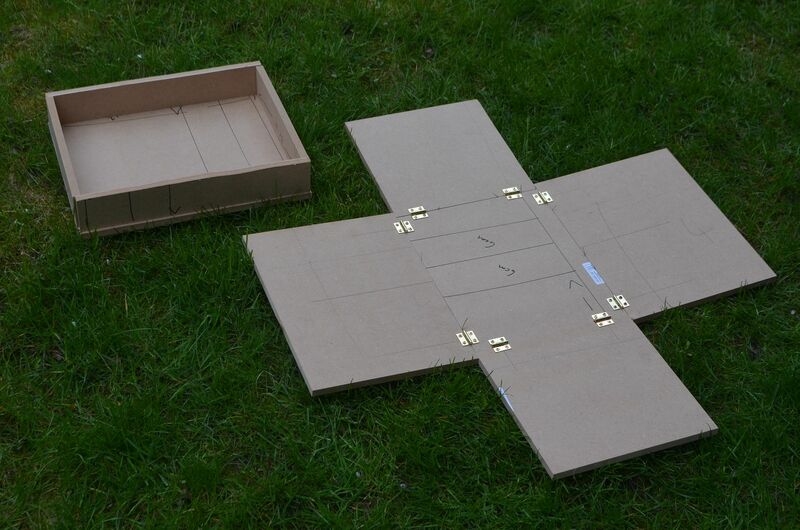 So in a sense it is a universal box* making for a good common denominator in a challenge like this. Also it costs ~ almost nothing. 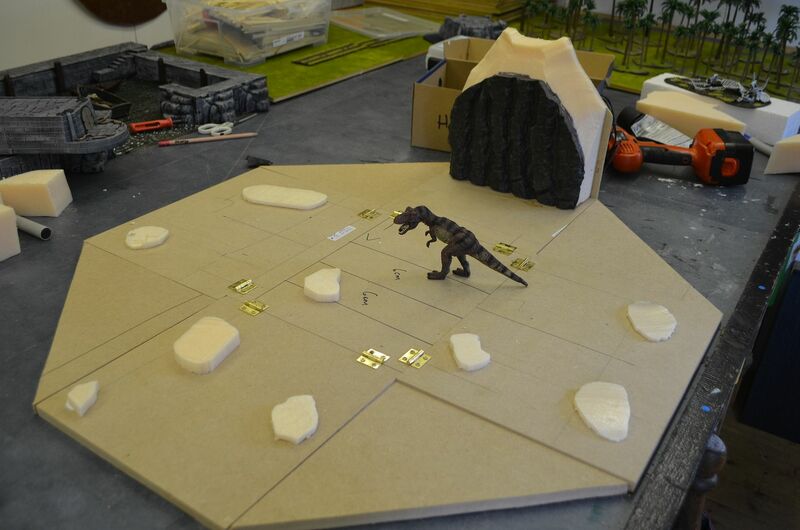 Anything is fair game; A 10mm massive thing, a 54 mm skirmish on a 4'x4' board and so on. Whatever you fancy! 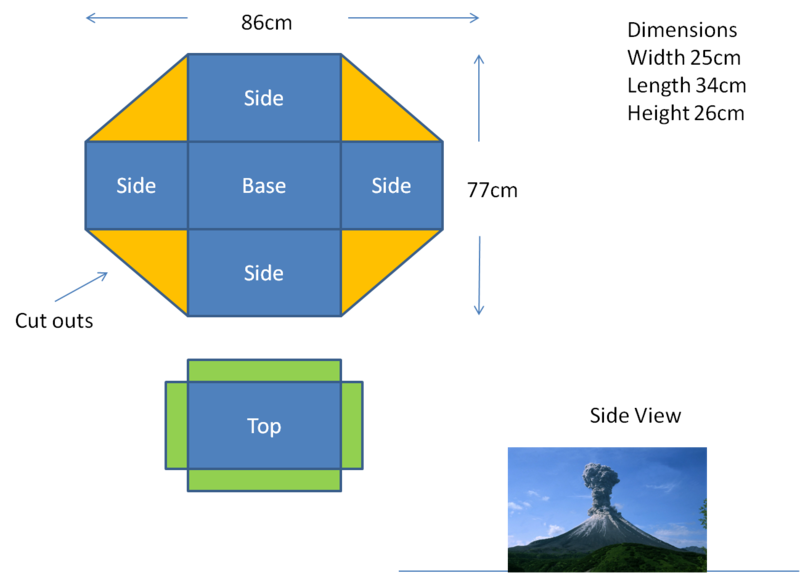 Also the box can enter into the thing anyway you want to: You can paint it, glue the rules on it, amend it's function or just keep it plain as a storage box. Anything within these boundaries is acceptable. So a trip off to B&Q to get some cut 12mm MDF and hinges. AS things progress there will be more updates here and on the Lead Adventure Forum. 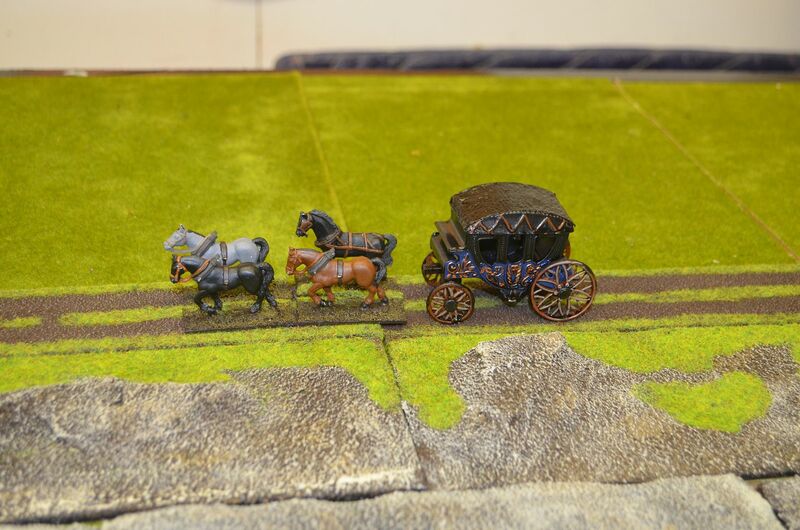 I managed to spend a reasonable amount of time in the shed this weekend and with no game played on Monday night I was able to manage a number of projects in one hit. 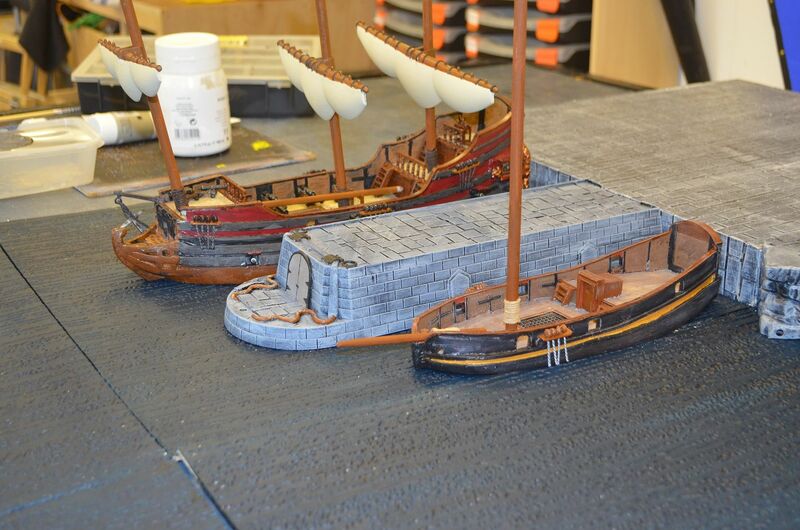 First up - I decided that the sea terrain needed to be improved for the pirate ships. A trip to B&Q and a few quid later I was the proud owner of 6 boards 50cm x 50cm. On these I pasted wall paper paper, and then painted black followed by a heavy green. I am in two minds as to whether or not I should paint the whitecaps on the waves ? Thoughts? 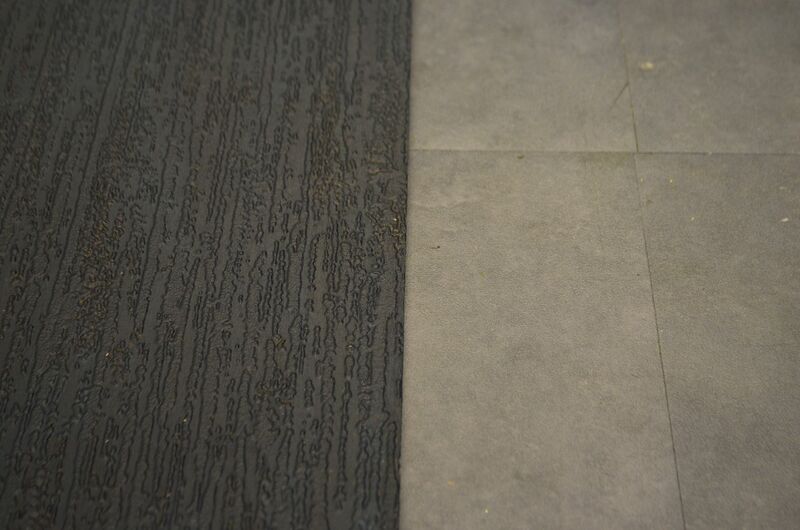 The photo below shows the sea tile on the left versus the old blue vinyl top mounted on the table. 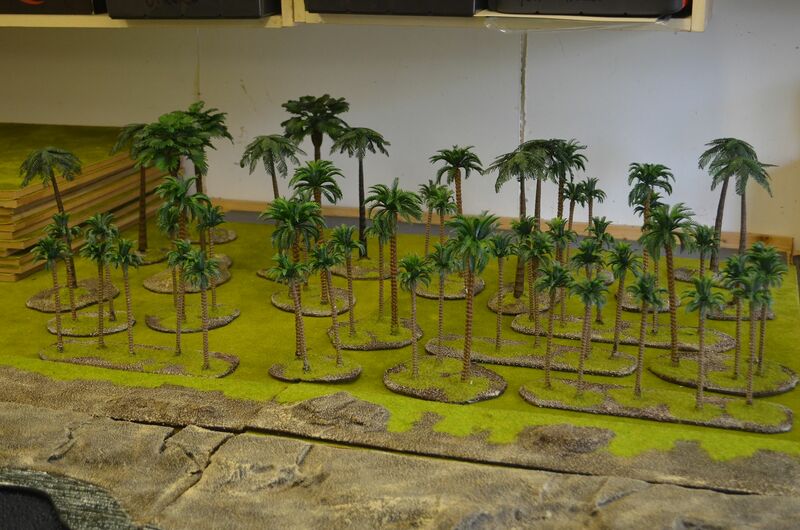 With the water in plan I started rummaging through the old bits and bobs box and came up with some kiddy rocky outcrops. 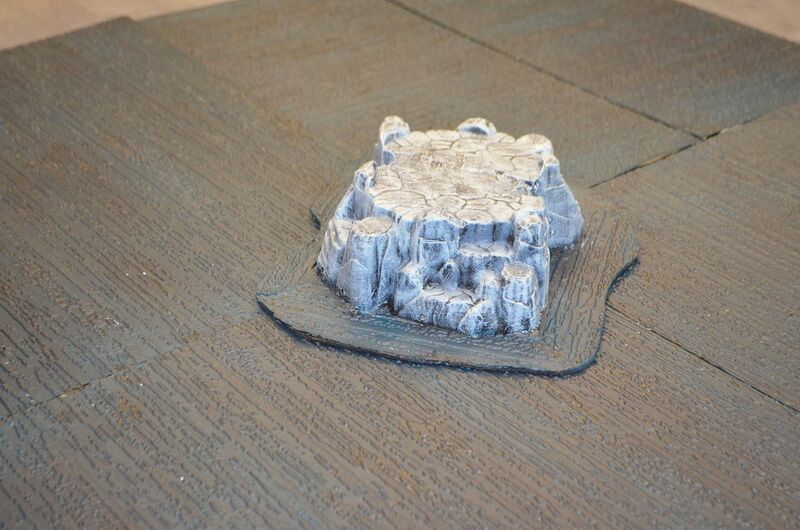 Glued onto hardboard, filled and painted black then grey - hey presto a small rocky island. This still needs some foliage and some crashing waves but its a nice little feature. The same rummage pulled out what can best be described as a stone jetty. Well thats what it became. 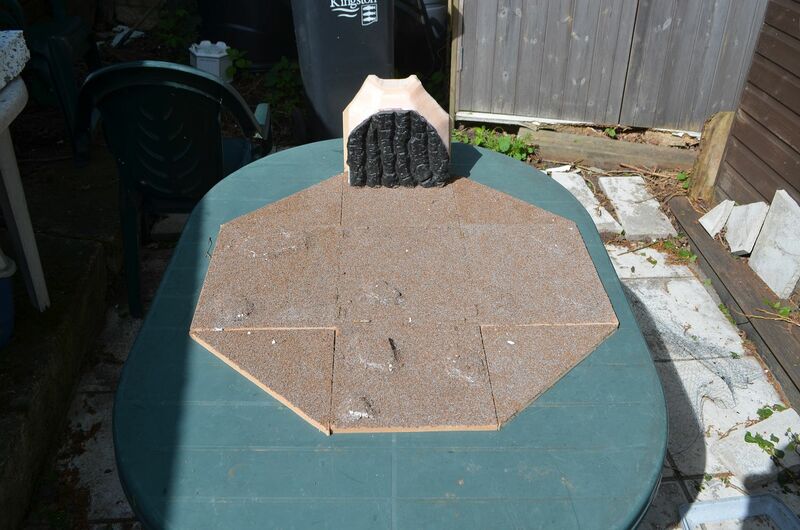 I pulled off all the ertraneous matter, resurfaced the top in flagstones and gave the whole thing a paint. It works really well and extends play in the harbour ! 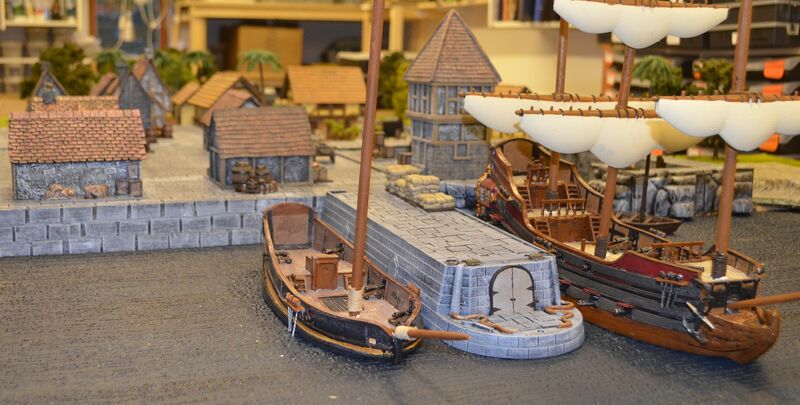 I also managed to finish off the Ainsty sloop. Just need to finish off the sails ! 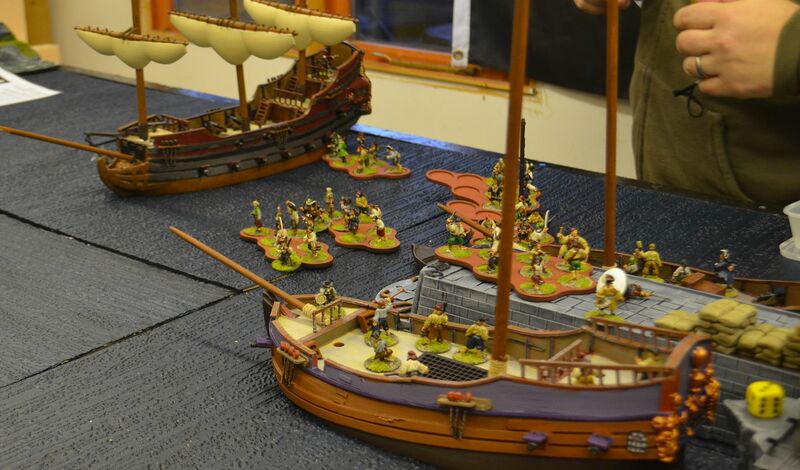 Coming up soon - A very big Pirate Battle ! !